With Drum Encounters you will experience a fun and innovative way to learn to play drums, designed to take you from beginner to advanced level. 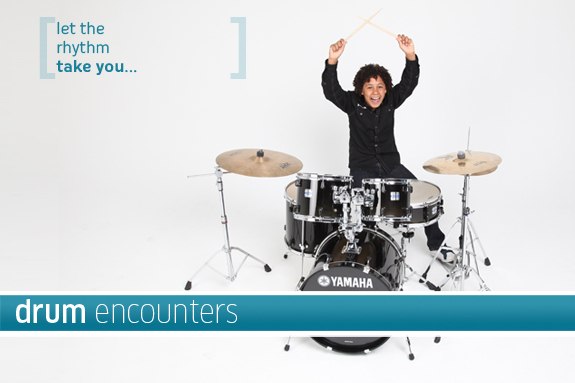 Open to anyone from the age of 8, Drum Encounters is ideal for those seriously considering a musical career and also for those who want to play just for fun. Taught in groups of up to six students our course offers you a unique way to learn. Nothing matches the exhilaration of six people drumming simultaneously! The course combines the best elements of traditional one-to-one drum lessons with a creative, modern approach, resulting in unrivalled quality of teaching. You will learn to play in a state-of-the-art Yamaha drum studio, using the best drums and practise pads. For those who don’t have a kit at home, your drum lessons will be the highlight of your week and it will give you all the skills you need to bring the beat to your band! Although Drum Encounters is designed to be a fun, leisure course, continuous assessment helps you to perfect your techniques and progress to more demanding playing styles. The course material provides a veritable encyclopaedia of drum patterns, fills and rudiments to prepare you for any drumming situation. The course is fully accredited by Rock School and you can take exams from Grade 1 to Grade 8 standard. From Grade 6 and above examination results also count towards your UCAS entry point. At Yamaha, all of our teachers are seasoned professionals – many are session musicians or band members – so you’re guaranteed the best possible tuition and with Yamaha’s ‘live’, whole-class teaching approach, we make sure that everyone in the group gets the attention they need. Drum notation is taught to supplement the skills and techniques you will learn and each course book contains a CD packed with excellent backing tracks and exercise for you to work through. As you progress you will learn how to play a broad range of great drum styles and unlock the secrets of a great performance in almost any drumming situation. Don’t worry if you haven’t got a drum kit at home, your teacher will advise you on various options, ranging from practise pads to a full drum kit. If noise is a problem just ask about the very latest electronic kits which you can play through headphones. They sound and feel wonderful and won’t leave you at war with other family members or the neighbours! Book a free taster lesson on Drum Encounters in order to experience this fantastic course for yourself.